To buy or not to buy, that is the question. Also, what currency to use? From a fundamental point of view, in the short term it can be argued that the US Dollar (USD) may be technically oversold and so due for a bounce. However, the long term trend is down for the USD and up for most Asian currencies. Also, there is a chance of a financial Armageddon over the medium term. If this happens there is a reasonable chance of a massive readjustment of the USD. Should this occur then the peak for the USD may well coincide with the trough for asset prices in Asia and this would be the perfect buying opportunity. People based in Thailand and remunerated in baht should focus on the local currency as the baht is be expected to continue to strengthen over the long term but, as stated above, there is a risk that we will see a flight to the greenback at some point in the next two years presenting a better opportunity to sell USD or to buy baht at something like a 20% lower rate versus the USD than today. However, this is far from being a certainty. Nevertheless, over the long term baht will get stronger against the USD. Hedging against a baht correction is another option, but this requires expertise in both timing and selecting the correct hedge. There are a number of products in the market which hedge in baht, the Singapore dollar as well as most of the major currencies. These have the ability to access offshore assets in baht. Also there are covered bond funds which currently yield about 7% a year in baht. By taking exposure to globally diversified portfolios in this way baht investors are able to diversify risk across global assets without taking currency risk. Perhaps the investors facing the toughest decision now are those who live and work locally but have their salaries, savings and investments in their national currencies. For example, in the past four years the spending power of British expats based in Thailand who are remunerated in Sterling has declined by about 40. Those earning in USD have seen a decline of about one-third over the same period. If you are in this boat and plan to stay in Thailand or the region for the foreseeable future, then you need to take a position which gives you the best return for your baht. Holding onto Western currencies indefinitely is increasingly unlikely to deliver this. The golden rule is that your income-producing assets should be held in or hedged to your currency of expenditure. Expats planning to return to their home countries could benefit from investing in emerging market currencies now, assuming these will continue to appreciate at a faster rate than USD or EUR. Another investment option is property. The USD to baht exchange rate is about 30 at the moment. If there is a market correction of about 20% then that would be a good time to bring money in to buy property. Keep it for a few years and, provided the baht has got stronger again, even if you only sell it for what you bought it for then you could make a nice profit in the base currency. 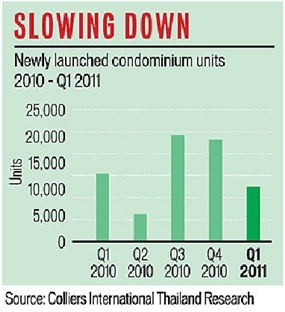 Colliers International Thailand has just announced that any concerns over an overheating condo market have been allayed as there was a drop of about 46% in new launches. They also cite the Bank of Thailand's new loan-to-value curbs on mortgage lending and the steady rise in interest rates has helped to restrain the breakneck pace of launches. So, it all depends what you want to do. A strong baht can help but it can also hinder. Just after 14:46, local time on March 11th, a 9.0-magnitude undersea earthquake occurred some 45 miles off the coast of North Eastern Japan. What we now know as the "Eastern Japan Great Earthquake Disaster" triggered a devastating tsunami almost 40 metres high which travelled up to 6 miles inland. The awful human toll still continues to become apparent, with the confirmed death toll continuing to rise. The scale of contamination and fallout from the stricken Fukushima nuclear power plants remains a grave concern, with the scale of the nuclear crisis now upgraded to the maximum of 7 - matching only Chernobyl. The financial implications of the crisis are only now starting to become clear, especially with regard to its impact on the Australian economy. Since the first quarter of 2009, Australia has witnessed one of its longest, strongest economic rebounds and asset market turnarounds, largely due to the flooding of global capital markets and the global economy with a massive amount of liquidity created by a combination of quantitative easing and additional borrowing by indebted governments, primarily in the USA, Eurozone, Japan and the UK. This liquidity has found its way to marginally priced assets, such as commodities, where relatively small differences in demand or supply can have a significant impact on prices as well as to ‘risk assets’ such as Thai stocks. - The long bull market in Australian property also began to unravel. The catastrophic events in Japan dramatically changed all this. Central banks, led by the Bank of Japan, turned on the liquidity taps once again. Consequently in the aftermath of terrible human tragedy, financial markets, risk assets and commodity currencies like the AUD once again rallied strongly. It is unlikely that this marks the beginning of the next stage of an inevitable or sustainable economic or financial boost. Although liquidity has been the key factor for the last couple of years, this cannot continue indefinitely. Japan is both printing and borrowing money right now but comparisons with the stimulatory effect on the Japanese economy of the aftermath of the 1994 Kobe earthquake are misplaced. 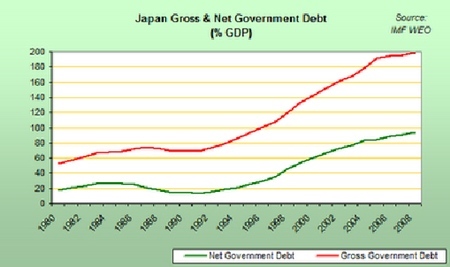 Japan's net sovereign debt 17 years ago was only a quarter of today’s levels. Gross government debt then stood at a high but manageable 80%. Today it has breached 200% - more than twice the accepted sustainable maximum. - America has seen its credit outlook downgraded. The continued ability of the four big debtor currencies to carry on feeding the liquidity bubble now seems a remote possibility. For an Australian economy that has become increasingly dependent on the minerals and commodity sectors, this is a flashing red light. The biggest casualties of any financial fallout from chickens coming home to roost in the four major debtor economies are likely to be commodity suppliers, especially as China is attempting to rein in inflation by restricting capital flows and liquidity within the seemingly overheating engine of global growth. That is not to say that there will not be further attempts to provide stimulus to the markets - there almost certainly will - many people are talking of a QE3 taking over when the present QE2 runs out in June. However, the risk that these attempts will fail is increasing every day. US stimulus has been having a greater impact on the recently increasing oil price (something which as a major input cost serves to strangle growth and productivity) than on economic activity within America - in other words stimulus has now become counter-productive. In such an environment, stimulus is self-defeating and slowdown is inevitable. So there may be a period of weeks or even months in which the attempts to continue giving the moribund indebted economies the kiss of life appears to be working, to the Australian economy’s benefit but the global economy’s day of reckoning, which was postponed two years ago and cannot be avoided indefinitely. Australia’s commodity-driven economy may enjoy the benefits of marginal pricing for a while longer, miners in Western Australia may allegedly continue to earn more than doctors, accountants or solicitors in Sydney for a few more months, Perth house prices may well carry on going up while Melbourne prices fall but the bursting of current bubble this year or next with ensuing dramatic corrections on the All Ordinaries and for the Australian Dollar look an even more certain bet after the recent tragic events in Japan. The human losses in Japan are a tragedy that will be remembered for many years to come. The financial impact on Australia of the bubble that now looks certain to burst will be a drama that will also be very hard to forget.